Naming your business is a crucial piece of launching your brand. It is often the first thing potential customers learn about your business. It should draw people in and sum up your brand identity. Although naming is a challenge, it does not have to feel like stepping off the edge of a cliff blindfolded. With the three stages laid out below, you can streamline your ideas and get the most out of your brand name. When selecting a name, it helps to get all of your ideas in one place. Create a document that you can refer back to throughout your naming process. Include key aspects of your brand. What do you do? What are your values? Why is what you are selling important? If others don’t feel that you’re passionate about your own brand, they will begin to question why they should care about it at all. Jotting down a few existing business names that you like can help you brainstorm. What do you like about these names? Are you trying to achieve a similar vibe? Compile a list of eight to ten of your favorite names, then dissect them. 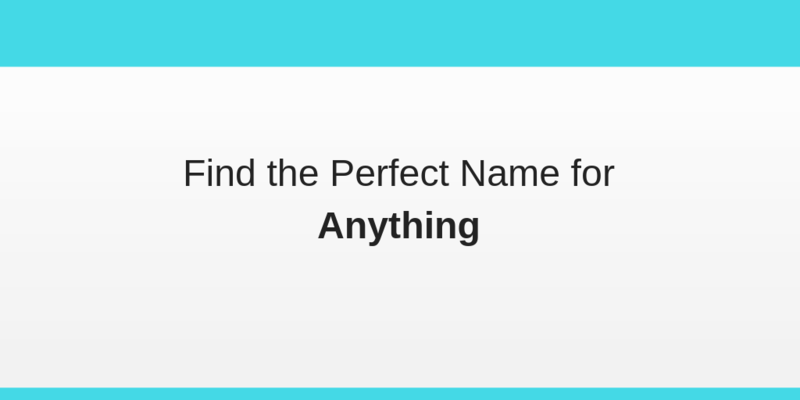 Explore these winning name ideas to start. Write a couple of bullet points about what you like about the name and why it works for that company. Dissecting your favorite names can provide direction to your naming process. A clothing brand targeted at successful middle-aged professional women will sound nothing like a fashion line for hip students, and there’s a reason. Your brand name should not just be about you, it should be about who you are selling to. Most successful names target a specific audience, drawing them in with values and emotions that resonate with them. For example, take the investing app Robinhood. Their platform focuses on making the investment process free and accessible for the average person, not just the wealthy. The name of their brand not only summarizes their values perfectly by using the story of the heroic bandit Robin Hood, it also appeals to a millennial audience. The name is youthful and fun, and it aligns with millennial values of convenience and fairness. Where do you want your brand to be in five years? What about ten years? If you’re planning on starting a company that might expand into new areas down the line, be careful not to choose a name that pigeonholes you. At the start, you may be launching a brand of socks, and you feel that the name SuperSocks could be a great fit, but if you plan to grow into other territories later, taking on accessories like hats and scarves, SuperSocks is no longer a suitable name. Planning ahead can help you avoid a costly rebranding process down the line. We need a name that captures our fun, unique approach to selling socks. We need a name that establishes us as a hip, young brand. Get started by writing a few project statements of your own. Now that all of your ideas are in one place and you’ve figured out what kind of name you want, you can start coming up with ideas. Start with the basic principles of a good name. A strong name is easy to say, easy to spell, and easy to hear. If people have a hard time sharing your brand, they won’t share it at all, stunting your brand’s climb to success. Now, it’s time for the fun part. Jot down every possible name you can think of that might fit the brand you are creating. Don’t be afraid to think out of the box, and don’t be afraid of writing down names you don’t like. The more you have to cross off the list, the better idea you will have of what you are looking for. Start broad. Some names are descriptive, abstract, emotional, or classic. You can merge words to form a name or use two separate words, to sum up your appeal. Write down a possible example for every name type you can think of. This can help you see what you’re looking for. The more names you have to work with, the better scope you’ll have. Now that you have compiled a broad range of ideas, begin crossing off ones that don’t work for you until you have a list of five or six favorites. This is a great opportunity to get second opinions from friends, family, or even your target market. A strong domain compliments a good name. Your website is where people will find out more about what you do, so it is best to have as close of a match as possible. Run a trademark risk test to ensure that your name isn’t already taken by a similar business. If your name is closely related to another name for a business that offers similar services, you may run into trouble with trademark law. Be proactive about trademark risk to avoid messy legal issues. Coming up with a strong name is a daunting task. So much rests upon a name. It is the sum of your brand’s identity, and it is the first point of connection for your audience. You may feel like all the best names are already taken, or that you have no good ideas, but the perfect name for your business is out there. It just takes a bit of prospecting and brainstorming to find it.